So, I know it’s almost a month and a half after Christmas, but I didn’t get a chance to post this over the holidays. I had an order for some festive cupcakes, and given that the holidays are my favorite time of the year, I took that offer straight away and decided to give you some tips and tricks on how I made them. After my cupcakes were completely cooled I made a batch of my vanilla buttercream, but also added 3/4 cup cocoa powder to make it have a rich chocolate flavor. I piped my signature swirl on the cupcake (hint hint… that post might be coming soon) and got to decorating. I crushed the candy canes in a plastic bag with a rolling pin and sprinkled some on. I got some edible pearls from my local supermarket and added those as well. Then I stuck my toppers in randomly. For the finishing touch, I dusted the cupcakes with some silver edible dust. I thought these turned out so cute, and they were so simple! These would be a great thing to do with kids around the festive season, and would most likely be a hit with your loved ones. I hope you had a great holiday break and I’ll see you on Thursday! So, a while back, I was asked to make a birthday cake for my good friend’s mom. I was looking around and discovered cake bunting. Cake bunting is basically a banner on top of a cake that shows a message like, “Happy Birthday” or “Just Married”. So since this was for a birthday, I decided to make a bunting banner myself. The instructions are below. So, other than the bunting, the cake turned out and tasted amazing. I made my coconut cake and frosting recipe, which you can see on the recipes page. I frosted the cake in lavender coconut buttercream and topped it off with some shredded coconut on top! First, measure how far apart you want your sticks to be. However many inches that may be cut 2 strings 1 inch longer than that width. Say I want my banner to be 6 inches long, I would cut two 7-inch pieces of string. Next, fold your letters in half to meet up with the other edge. Put a little glue on the crease and on one side of the crease. Do not glue together yet! Fold the letters onto the string, so that the string is right in the crease of the letter.Do this to all of your remaining letters. Make sure to leave at least 1 inch of string on each side for taping. Finally, wrap your remaining string around 1 stick and tape securely at the very top of the stick. You want to make sure to do this because you want to have room for the second string underneath that. Do the same to the other side and move onto the bottom row. Tape the string right under the first row’s because you want your sign to be tall enough to stand on the cake, but not touch it. This is an easy and fun way to decorate your cake and spread a nice message to the person/people you love. would have if I had used all-purpose. Even though cake flour is more expensive, it is totally worth it, especially if you sell your baked goods. brands to choose from too! I really recommend this product because it is great in so many ways! I dyed my fondant royal blue, as that was the color scheme. The day after, I baked my cupcakes. Then I assembled my 48 cupcakes on a 20 x 30″ board. I glued my cupcakes on the board with a dot of frosting. Finally, I frosted all of my cupcakes and put the flowers and ribbon on. I really liked how it turned out, and it was pretty easy too! 2. Don’t have a piping bag? Don’t sweat it. You can use a Ziploc bag. Just put your icing in, snip of a corner or put a piping tip in, and pipe away! 3. 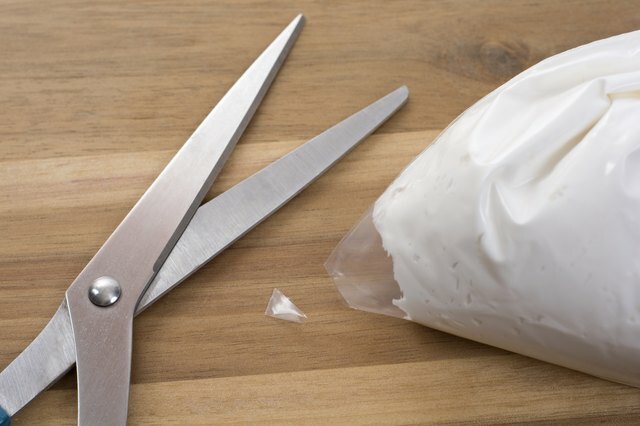 To make putting frosting in a piping bag easier, fold the ends of the bag over a cup, and fill with your favorite icing. 4. Are you too lazy to grease your pan? Just cut out a circle of parchment paper the size of your pan, and put it in the bottom of the pan. This also makes cleanup easier. 5. Oh no! You ran out of brown sugar and don’t want to go to the store to get more. Just take a cup of regular sugar and 1 tablespoon of molasses. Mix it all up, and you’ve got yourself some brown sugar! This entry was posted in Hacks. So, what’s the difference between buttercream and Italian meringue buttercream? First of all, they are both made with completely different ingredients. Regular buttercream is made of butter, powdered sugar, milk, and vanilla while Italian Meringue is made of egg whites, regular sugar, butter, vanilla, and cream of tartar. Italian Meringue Buttercream is light and fluffy. It is not too sweet and keeps its shape because of the egg whites. Regular Buttercream is fluffy and on the thicker side. It is perfect for icing cupcakes and cakes. I use regular buttercream for icing vanilla or chocolate cakes/cupcakes, and Italian Meringue for Salted Caramel cake and Apple cake.They both have great taste. So, at the end of the day, it’s really your choice. Below are links to the buttercream recipes that I use. This entry was posted in Recipes, Reviews. So, today I experimented with Wilton’s Treatology Flavor System. This is a kit that comes with 8 artificial flavorings: Salted Caramel, Creamy Vanilla Custard, Toasted Coconut, Sweet Meyer Lemon, Juicy Peach, Fresh Basil, Crisp Champagne, and Warm Cinnamon Graham. These flavorings can be used in cake batter, frosting, and many more desserts. I made my favorite vanilla cake recipe and split the batter into 6 bowls. (I didn’t use the champagne or basil.) I added a few drops to each bowl and baked them. Then came the taste test! I was actually disappointed about the flavor. The cake tasted very artificial and fake. I haven’t tested the flavors using frosting, though, so maybe it will be different. I will post when I do test it. Here is the link to the Flavor System if you would like to try it. This Valentine’s Day I hosted a bake sale. I made cookies and cupcakes, and sold out! These cookies were decorated using royal icing and a toothpick. I used the toothpick to swirl the icing in different directions to make different patterns and designs. I also used Wilton piping tip #12, to pipe the borders and stripes. To get the icing so smooth, I used an offset spatula. I’ll put all of the links for the best prices at the end of this post. These vanilla cupcakes were decorated with lavender frosting and pastel fondant, to look like sweetheart candies. I used a special swirl tip to pipe the frosting which I linked in my last post, but I’ll link it again. I used a mini heart fondant cutter and dyed the fondant with Ameri color gel food coloring. I also used royal icing for this. I used the Wilton piping tip #3 for the dots, and also used an offset spatula to get the icing smooth.